This series of GAS mask is generally sold and sent overseas. We have retained a number of these masks For Our U.S. Customers only. The X-GM2001 is a close-fitting soft rubber gas mask and offers excellent face, eye and respiratory protection against many chemical and biological agents. This gas mask, which comes complete with filter, are factory new! 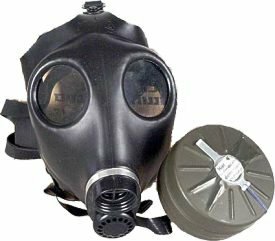 These are a limited number of the second generation NBC Nuclear, Biological, Chemical gas masks for civilian purchase and civilian issue. Their filter can be changed without removing the mask.